All my students starved to death. Again. Here’s what they learned the hard way: generosity today can be a way of saving for tomorrow. They were survivors of a plane crash on a desert island. They knew they’d be trapped there for months and that the only food would be the large but elusive fish in the sea. When one of my students managed to catch a fish, he ate as much as he could, then stored the rest for himself under some rocks near the beach. Other students, less successful as fishermen, starved to death promptly. Soon, the initially successful fisherman found himself alone on the island. With no refrigeration, the food he’d stashed rotted away. And when he ventured out fishing again, he was unlucky and got stung by a deadly jellyfish. With no one left to take care of him, he, too, perished. We play this game while studying the famous Ju/’hoansi hunter-gatherers. Until the colonial encroachments of the 20th century, most Ju/’hoansi lived in small, nomadic groups in the Kalahari desert, the men hunting with bows and arrows and the women collecting nuts, berries, and roots with digging sticks and carrier sashes. Every year, in the discussions that follow our brief reading on this culture, my students remark with amazement that whenever a Ju/’hoan man or woman finds food, he or she shares it widely with the community. This behavior seems to be an important part of why Richard B. Lee, the most prominent anthropologist in the study of the Ju/’hoansi, describes them as “primitive communists” in the Marxian sense. And many of my students each year seem to get the idea that the Ju/’hoansi share their food so freely with each other because they are in some way more charitable, more natural, or otherwise more moral than us. So I like to play this little starvation game to disabuse my students of their romantic notions about communist noble savages in the African wilderness. What, I ask, would happen if a bunch of greedy, selfish people like us found themselves in the same economic situation the Ju/’hoansi face? Nomadic foragers like the Ju/’hoansi have unreliable “incomes” in terms of the food they find from day to day and week to week. They are often masterful trackers and foragers. But, no matter how competent you are, when you pursue a giraffe on foot with a bow and arrow, sometimes the giraffe gets away. Successful fishermen imitate the Ju/’hoansi. They give away their excess food freely, starting with their friends or closest neighbors at the game table. The students starve to death en masse. My students tend to go into this game with an idealistic view of the Ju/’hoansi as selfless, altruistic people. They tend to finish the game realizing that, even if you were the greediest, most selfish nomadic forager in the world, your best move would still be to share food with your neighbors. Since nomadic foragers have a difficult time storing physical capital, especially food, their response all around the world, in culture after culture, is to promptly turn it into human capital by giving it to friends, relatives, and neighbors. Like my students, Ju/’hoansi men and women are tempted to hoard their own wealth. Indeed, Ju/’hoansi elders often lament that they have given generously all their lives and would now like to keep just a little for themselves. But the Ju/’hoansi also have a massive corpus of gift-exchange rituals, conversational habits, and even stock jokes that they use to bolster their own patience and to bring hoarders peacefully into line. These behaviors represent the heritage of thousands of years of spontaneous-order cultural development under economic conditions in which short-run greed is tantamount to stupidity. What makes the Ju/’hoansi seem selfless, or communistic, or morally superior to us is their age-old cultural adaptation to the fact that, for each individual in their situation, the best strategy to save for the future is to share widely in the present. In the very different economic and technological circumstances of the industrialized West, we have our own roundabout methods by which our selfish desires lead to social prosperity. In markets, each of us can still provide best for his or her own future by helping others — especially strangers — for the right price. Would this same system work for hunter-gatherers? If a group of 19th-century Ju/’hoansi equipped with digging sticks and bows and arrows had tried the ethics of the modern market for themselves, many might have starved to death before they recognized their error and began to recreate a culture more appropriate to their own ecology and technology. But what works for the Ju/’hoansi would be devastating for us. If we today, in a market society made up largely of strangers, attempted to practice the ethics of profligate sharing and meek humility — or even worse, to enforce such ethics on noncompliant others through government policies — we would drive our whole society into chaos and penury. The Ju/’hoansi’s strategy works only for people in the Ju/’hoansi’s situation. Our own great wealth and our own social order are built on savings and investment — and on using our resources to benefit strangers through market exchange. Mike Reid is a publishing consultant at InvisibleOrder.com and the publications impresario at Liberty.me. He also teaches anthropology at the University of Winnipeg. Mike lives in Manitoba with his wife and two children. Were it not for the deeply fallacious and self-defeating mindset of voting for the “lesser evil”, the rise of a demagogue such as Trump would have been impossible in the United States. Though it may be alleged that economic fascism has characterized America’s “mixed economy” since at least the New Deal of the 1930s, the resurgence of cultural fascism would have been unthinkable even during the 2012 Presidential Election. Yet it is here in the form of Donald Trump’s campaign. Mr. Stolyarov considers what made possible this frightening resurgence of the worst tendencies in American politics. He concludes that the biggest underlying facilitator of Trump’s frightening rise is the very two-party political system in the United States and the “lesser evil” trap it engenders in the minds of many voters. This article is republished with the author’s permission. It was originally posted on Radical Science News. 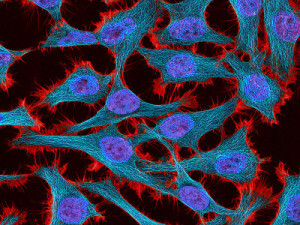 Multiphoton fluorescence image of HeLa cells. Aging, inflammation, cancer, and cellular senescence are all intimately interconnected. Deciphering the nature of each thread is a tremendous task, but must be done if preventative and geriatric medicine ever hope to advance. A one-dimensional analysis simply will not suffice. Without a strong understanding of the genetic, epigenetic, intercellular, and intracellular factors at work, only an incomplete picture can be formed. However, even with an incomplete picture, useful therapeutics can be and are being developed. One face is cancer, in reality a number of diseases characterized by uncontrolled cell division. The other is degradation, which causes a slue of degenerative disorders stemming from deterioration in regenerative capacity. Now there is a new focus on making geroprotectors, which are a diverse and growing family of compounds that assist in preventing and reversing the unwanted side effects of aging. Senolytics, a subset of this broad group, accomplish this feat by encouraging the removal of decrepit cells. A few examples include dasatinib, quercetin, and ABT263. Although more research must be done, there are a precious handful of studies accessible to anyone with the inclination to scroll to the works cited section of this article. Those within the life-extension community and a few enlightened souls outside of it already know this, but it bears repeating: in the developed world all major diseases are the direct result of the aging process. Accepting this rather simple premise, and you really ought to, should stoke your enthusiasm for the first generation of anti-aging elixirs and treatments. Before diving into the details of these promising new pharmaceuticals, nanotechnology, and gene therapies we must ask what is cellular senescence? What causes it? What purpose does it serve? Depending on the context in which it is operating, a single gene can have positive or negative effects on an organism’s phenotype. Often the gene is exerting both desirable and undesirable influences at the same time. This is called antagonistic pleiotropy. For example, high levels of testosterone can confer several reproductive advantages in youth, but in elderly men can increase their likelihood of developing prostate cancer. Cellular senescence is a protective measure; it is a response to damage that could potentially turn a healthy cell into a malignant one. Understandably, this becomes considerably more complex when one is examining multiple genes and multiple pathways. Identifying all of the players involved is difficult enough. Conboy’s famous parabiosis experiment, where a young mouse’s system revived an old ones, shows that alterations in the microenviornment, in this case identified and unidentified factors in the blood of young mice, can be very beneficial to their elders. Conversely, there is a solid body of evidence that shows senescent cells can have a bad influence on their neighbors. How can something similar be achieved in humans without having to surgically attach a senior citizen to a college freshman? By halting its own division, a senescent cell removes itself as an immediate tumorigenic threat. Yet the accumulation of nondividing cells is implicated in a host of pathologies, including, somewhat paradoxically, cancer, which, as any life actuary’s mortality table will show, is yet another bedfellow of the second half of life. The single greatest risk factor for developing cancer is age. The Hayflick Limit is well known to most people who have ever excitedly watched the drama of a freshly inoculated petri dish. After exhausting their telomeres, cells stop dividing. Hayflick et al. astutely noted that “the [cessation of cell growth] in culture may be related to senescence in vivo.” Although cellular senescnece is considered irreversible, a select few cells can resume normal growth after the inactivation of the p53 tumor suppressor. The removal of p16, a related gene, resulted in the elimination of the progeroid phenotype in mice. There are several important p’s at play here, but two are enough for now. Our bodies are bombarded by insults to their resilient but woefully vincible microscopic machinery. Oxidative stress, DNA damage, telomeric dysfunction, carcinogens, assorted mutations from assorted causes, necessary or unnecessary immunological responses to internal or external factors, all take their toll. In response cells may repair themselves, they may activate an apoptotic pathway to kill themselves, or just stop proliferating. After suffering these slings and arrows, p53 is activated. Not surprisingly, mice carrying a hyperactive form of p53 display high levels of cellular senescence. To quote Campisi, abnormalities in p53 and p15 are found in “most, if not all, cancers.” Knocking p53 out altogether produced mice unusually free of tumors, but those mice find themselves prematurely past their prime. There is a clear trade-off here. In a later experiment Garcia-Cao modified p53 to only express itself when activated. The mice exhibited normal longevity as well as an“unusual resistance to cancer.” Though it may seem so, these two cellular states are most certainly not opposing fates. As it is with oxidative stress and nutrient sensing, two other components of senescence or lack thereof, the goal is not to increase or decrease one side disproportionately, but to find the correct balance between many competing entities to maintain healthy homeostasis. As mentioned earlier, telomeres play an important role in geroconversion, the transformation of quiescent cells into senescent ones. Meta-analyses have shown a strong relationship between short telomeres and mortality risk, especially in younger people. Although cancer cells activate telomerase to overcome the Hayflick Limit, it is not entirely certain if the activation of telomerase is oncogenic. SASP (senescence-associated secretory phenotype) is associated with chronic inflammation, which itself is implicated in a growing list of common infirmities. Many SASP factors are known to stimulate phenotypes similar to those displayed by aggressive cancer cells. The simultaneous injection of senescent fibroblasts with premalignant epithelial cells into mice results in malignancy. On the other hand, senescent human melanocytes secrete a protein that induces replicative arrest in a fair percentage of melanoma cells. In all experiments tissue types must be taken into account, of course. Some of the hallmarks of inflammation are elevated levels of IL-6, IL-8, and TNF-α. Inflammatory oxidative damage is carcinogenic and an inflammatory microenvironment is a good breeding ground for malignancies. Caloric restriction extends lifespan in part by inhibiting TOR/mTOR (target of rapamycin/mechanistic target of rapamycin, also called the mammalian target of rapamycin). TOR is a sort of metabolic manager, it receives inputs regarding the availability of nutrients and stress levels and then acts accordingly. Metformin is also a TOR inhibitor, which is why it is being investigated as a cancer shield and a longevity aid. Rapamycin has extended average lifespans in all species tested thus far and reduces geroconversion. It also restores the self-renewal and differentiation capacities of haemopoietic stem cells. For these reasons the Major Mouse Testing Program is using rapamycin as its positive control. mTOR and p53 dance (or battle) with each other beautifully in what Hasty calls the “Clash of the Gods.” While p53 inhibits mTOR1 activity, mTOR1 increases p53 activity. Since neither metformin nor rapamycin are without their share of unwanted side effects, more senolytics must be explored in greater detail. Starting with a simple premise, namely that senescent cells rely on anti-apoptotic and pro-survival defenses more than their actively replicating counterparts, Campisi and her colleagues created a series of experiments to find the “Achilles’ Heel” of senescent cells. After comparing the two different cell states, they designed senolytic siRNAs. 39 transcripts were selected for knockdown by siRNA transfection, and 17 affected the viability of their target more than healthy cells. Dasatinib, a cancer drug, and quercitin, a common flavonoid found in common foods, have senolytic properties. The former has a proven proclivity for fat-cell progenitors, and the latter is more effective against endothelial cells. Delivered together, they they remove senescent mouse embryonic fibroblasts. Administration into elderly mice resulted in favorable changes in SA-BetaGAL (a molecule closely associated with SASP) and reduced p16 RNA. Single doses of D+Q together resulted in significant improvements in progeroid mice. If you are not titillated yet, please embark on your own journey through the gallery of encroaching options for those who would prefer not to become chronically ill, suffer immensely, and, of course, die miserably in a hospital bed soaked with several types of their own excretions―presumably, hopefully, those who claim to be unafraid of death have never seen this image or naively assume they will never be the star of such a dismal and lamentably “normal” final act. There is nothing vain about wanting to avoid all the complications that come with time. This research is quickly becoming an economic and humanitarian necessity. The trailblazers who move this research forward will not only find wealth at the end of their path, but the undying gratitude of all life on earth. Blagosklonny, M. V. (2013). Rapamycin extends life-and health span because it slows aging. Aging (Albany NY), 5(8), 592. Campisi, Judith, and Fabrizio d’Adda di Fagagna. “Cellular senescence: when bad things happen to good cells.” Nature reviews Molecular cell biology 8.9 (2007): 729-740. Campisi, Judith. “Aging, cellular senescence, and cancer.” Annual review of physiology 75 (2013): 685. Hasty, Paul, et al. “mTORC1 and p53: clash of the gods?.” Cell Cycle 12.1 (2013): 20-25. Kirkland, James L. “Translating advances from the basic biology of aging into clinical application.” Experimental gerontology 48.1 (2013): 1-5. Lamming, Dudley W., et al. “Rapamycin-induced insulin resistance is mediated by mTORC2 loss and uncoupled from longevity.” Science 335.6076 (2012): 1638-1643. LaPak, Kyle M., and Christin E. Burd. “The molecular balancing act of p16INK4a in cancer and aging.” Molecular Cancer Research 12.2 (2014): 167-183. Malavolta, Marco, et al. “Pleiotropic effects of tocotrienols and quercetin on cellular senescence: introducing the perspective of senolytic effects of phytochemicals.” Current drug targets (2015). Rodier, Francis, Judith Campisi, and Dipa Bhaumik. “Two faces of p53: aging and tumor suppression.” Nucleic acids research 35.22 (2007): 7475-7484. Rodier, Francis, and Judith Campisi. “Four faces of cellular senescence.” The Journal of cell biology 192.4 (2011): 547-556. Salama, Rafik, et al. “Cellular senescence and its effector programs.” Genes & development 28.2 (2014): 99-114. Tchkonia, Tamara, et al. “Cellular senescence and the senescent secretory phenotype: therapeutic opportunities.” The Journal of clinical investigation 123.123 (3) (2013): 966-972. Zhu, Yi, et al. “The Achilles’ heel of senescent cells: from transcriptome to senolytic drugs.” Aging cell (2015). Demagogue politicians love to play on popular fears that low-wage foreigners are “stealing” good-paying American jobs by way of outsourcing and globalization. The claim is made by nativists and protectionists of all political stripes, whether leftists complaining of a “rigged economy” or rightists speaking of other countries “beating us” economically. A sound economic analysis of the claim about job losses due to international trade should address two questions: First, is it true that the US has lost jobs due to trade (or other factors)? Second, is this phenomenon good or bad overall for the US and world economies? On the first point, it can appear as though the US has lost jobs. For example, as Figure 1 shows, manufacturing employment in the US has declined by about 2 million from pre-Great Recession levels, and is down by over 7 million, or 37 percent, from the all-time high reached in 1979. 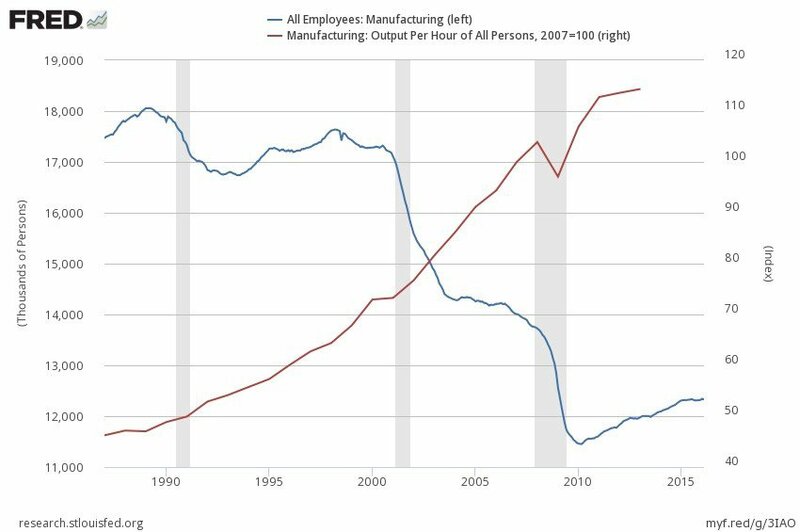 The problem, though, is that by looking at manufacturing in terms of jobs, we’re missing the full picture of industrial production. Nevertheless, the demagogues still argue that, even though high-paying service sector jobs have more than replaced lost factory jobs, “we don’t make things here anymore” and we should lament this. This oft-heard refrain is patently false. We don’t make certain things, such as garments, toys or electronics, because global free trade and technological advances tend to shift America’s output into those industries in which our comparative advantage is greatest. But Americans do indeed make things — quite valuable things. This can be seen in Figure 2, which shows the US Industrial Production Index for the “de-industrialization” period. After the expected steep decline following the Great Recession of 2008–2009, US manufacturing has slowly bounced back and is now producing more products, in value-added terms, than ever before. Indeed, this index, which consists mainly of manufacturing, has grown by over 100 percent since the 1979 peak in manufacturing employment. In other words, thanks to productivity gains, we need fewer workers to make more stuff. From an economic perspective, nothing could be better news. US manufacturing creates 100 percent more value with 37 percent fewer workers. Creating more value with fewer workers means we’re more efficient than ever, or put another way, more productive than ever. These awesome productivity gains have many sources, especially in the form of technological advances in areas like software, robotics, and communications. Globalization and outsourcing have also played a role, as they allow American workers a greater degree of specialization in those sectors where our productivity edge is largest. The good news gets better, though: not only have we gained jobs on net, but jobs have grown faster than the population over time. 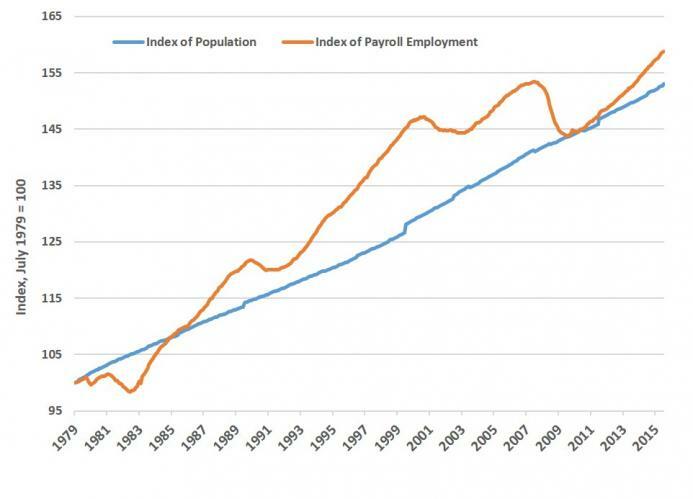 Since the 1979 peak in manufacturing employment, the US adult population grew by 53 percent, whereas employment grew by 59 percent, as shown in Figure 3. Despite these generally positive facts, some still contend that we’ve replaced “good” manufacturing jobs with lousy service sector jobs. Well, of course it must be true that, if we’ve lost manufacturing jobs, but gained jobs overall, then all of the job gains must have come from non-manufacturing sectors. And indeed the service sector, broadly defined, has seen employment growth of 90 percent since our 1979 benchmark. But beware of making hasty earnings assumptions about a sector that employs nearly 124 million people. To see whether the newly-created “service sector” jobs really don’t pay as well as the vaunted manufacturing jobs, we need to drill down into the employment and earnings data. What we’ll find is that a large majority of the new service sector jobs pay just as well or much better than manufacturing jobs. 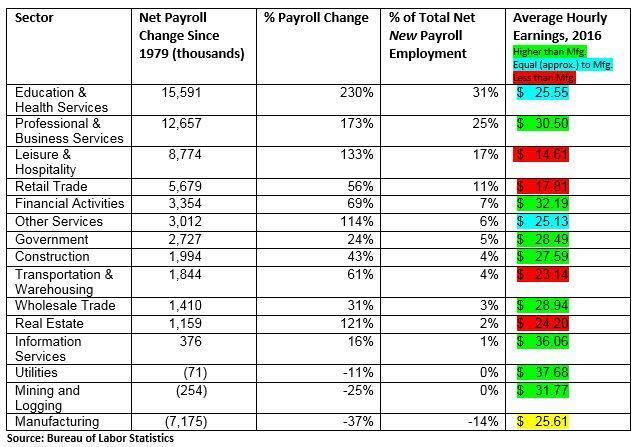 Table 1 presents Bureau of Labor Statistics data on the 15 largest sectors and sub-sectors of the US economy, which together represent over 96 percent of the total net increase in payroll employment for the post-peak manufacturing jobs era (1979 to 2016). This might come as a surprise to the anti-globalization crowd: despite the loss of 7 million manufacturing jobs (and some mining, logging, and utilities sector jobs), we’ve seen a net increase of nearly 53 million total jobs. Of these net new jobs, fully 62 percent of them feature, as of January 2016, average hourly earnings equal to or greater than current average hourly manufacturing earnings. In other words, most of the 53 million new jobs pay the same or better wages than the demagogues’ benchmark “good” manufacturing jobs. So we lost 7 million good jobs, only to gain about 32 million equal or better-paying jobs, along with about 19 million lower-paying jobs (about 38 percent of net new jobs pay less than manufacturing). We’ve established that, despite a major decrease in employment in the manufacturing sector, we’ve gained many more jobs than we’ve lost in the past 35 years or so, and that most of these new jobs pay better to boot. Economic changes, while painful in the short run, have brought gains in output and employment not only for the US, but for the rest of the world as well. Overall, this is good news for the US and world economies. Tyler Watts earned his PhD in economics at George Mason University in 2010. He currently teaches economics at East Texas Baptist University and runs the Institute for Economic Education (see YouTube channel here), a public outreach focused on integrating economics with a Biblical worldview and providing unique teaching tools for high school and college economics students. It is disconcerting to watch as the front-runner for the 2016 Republican Presidential nomination in the United States espouses a genuinely fascistic agenda – not just in terms of protectionism, economic nationalism, militarism, and the desire to centrally plan economic greatness – but also in terms of the overtly uglier sides of historical fascism: the xenophobia, racism, advocacy of torture and blood guilt, desire to silence political opponents, and incitements to violence against protesters and dissenters. Yet this is precisely what Donald Trump has done, unleashing the long-dormant worst tendencies of American politics. He has emboldened the crudest, least enlightened, most hide-bound enemies of tolerance, cosmopolitanism, and liberty to emerge from well-deserved disgrace to fuel the campaign of a cynical, unprincipled opportunist who thrives by pandering to their lowest impulses. Trump is vulgar, volatile, and unhinged. He has already turned his rallies into miniature versions of the police state he would create if elected – evicting even protesters who simply stand there with signs or clothing that express disagreement with Trump, or even individuals who attract the ire of the frenzied Trumpists for having the “wrong” color of skin or the “wrong” incidental expressions. Because of a bizarre law (H. R. 347, enacted in 2012), it is illegal to protest inside Trump rallies (or rallies of any candidate that receives Secret Service protection), so Trump is already utilizing coercive police powers to suppress dissent. Though it may be alleged that economic fascism has characterized America’s “mixed economy” since at least the New Deal of the 1930s, the resurgence of cultural fascism would have been unthinkable even during the 2012 Presidential Election. Mitt Romney, who seemed to me at the time to represent a paradigm of crony capitalism that inched toward overarching totalitarianism, now appears to be a gentleman and an intellectual – a voice of reason, class, and prudence in his eloquent denunciation of Donald Trump. Romney, as President, would have been unlikely to avert an incremental descent into fascism (although, in retrospect, he seems to be a decent human being), and his own candidacy was marred by manipulations at various State Republican Conventions, but, compared to Trump, Romney is a model of civility and good sense. Romney, if elected, would primarily have been the next status-quo President, overseeing a deeply flawed and deteriorating but endurable economic, political, and civil-liberties situation. Trump, however, would plunge the United States into an abyss where the remnants of personal liberty will suffocate. the rule change enacted by the party establishment at the National Convention, over the vociferous objections of the majority of delegates there, has permanently turned the Republican Party into an oligarchy where the delegates and decision-makers will henceforth be picked by the ‘front-runner’ in any future Presidential contest. Gone are the days when people like me could, through grass-roots activism and participation at successive levels of the party conventions, become delegates to a state convention and exert some modicum of influence over how the party is governed and intellectually inclined. The Republican Party establishment intended its rule change to prevent the ability of motivated grass-roots activists to elect delegates at State Conventions who would vote against the “presumptive nominee” and in favor of an upstart – presumably more libertarian – contender such as Ron Paul. Little did the establishment expect that this rule change would prevent its own favored candidates from effectively contesting Donald Trump’s nomination if Trump continues to win popular votes, especially in “winner-take-all” primaries, and approaches a majority of the total delegates. The most that the Republican Party elites can hope for now is that a candidate such as Ted Cruz eventually overtakes Trump, or that the remaining candidates – Cruz, Marco Rubio, and John Kasich – split enough of the delegates to deny Trump the majority and lead to a brokered convention. But as the narrative of inevitability continues to be spun in Trump’s favor and he amasses prominent endorsements and even promises from the other candidates that they would support him if he were the nominee, these damage-control plans seem quite vulnerable. Blind party loyalty, combined with a bandwagon mentality, appears to be driving the Republican establishment to a reluctant capitulation to Trump – which would be political suicide, but they are apt to do it anyway. many have fallen for Donald Trump’s claim that he deserves support solely because he owes nothing to anyone. Therefore, he is not part of the establishment. Why is that good for liberty? He has said nothing about dismantling power. […] He wants surveillance, controls on the internet, religious tests for migration, war-like tariffs, industrial planning, and autocratic foreign-policy power. He’s praised police power and toyed with ideas such as internment and killings of political enemies. His entire governing philosophy boils down to arbitrary, free-wheeling authoritarianism. Yet the biggest underlying facilitator of Trump’s frightening rise is the very two-party political system in the United States. Had the ballot-access laws not been rigged against “third” political parties and independent candidates, and had representation been determined on a proportional rather than a “winner-take-all” basis, there would have been genuine alternatives for voters to choose from. At present, however, every recent election season has degenerated into a spectacle of demonizing “the other side” – even if that side is just a different wing of the same political establishment. Far too many people vote for “the lesser evil” in their view, rather than the candidate with whom they agree most (who will most likely be a minor-party or independent candidate, since both the Republican and Democratic Parties are widely perceived as ineffectual and misguided once actually in power). Instead of evaluating specific candidates based on their stances on the issues as well as their personal record of integrity (or lack thereof), too many voters have learned to viscerally hate “the other” party’s brand and exhibit unconditional loyalty to their own. During the primary process, even voters who prefer the candidates who did not become the nominee will often capitulate and embrace a deeply flawed frontrunner. If too many Republican voters come to believe that Hillary Clinton or Bernie Sanders would be intolerable choices for President, then they may come to rally behind Trump even if they personally would have preferred Rubio, Cruz, or Kasich – and that is how a fascistic campaign could elicit the support of even the many non-fascists who simply cannot distance themselves from the “R” next to a candidate’s name. The most reliable way to avoid adverse moral responsibility in voting is to vote for a candidate whom one considers to be an improvement over the status quo in absolute, not relative, terms – and without regard for how others might vote. Morality is not based on consensus, but on objective truth. One’s own understanding of objective truth, and the continual pursuit of improving that understanding, is the best path to moral action and the habits of thought that facilitate it. voters who are caught in the expectations trap will tend to vote for the “lesser evil” (in their view) from one party, because they tend to think that the consequences of the election of the candidate from the other party will be dire indeed, and they do not want to “take their vote away” from the slightly less objectionable candidate. This thinking rests on the false assumption that a single individual’s vote, especially in a national election, can actually sway the outcome. Given that the probabilities of this occurring are negligible, the better choice – the choice consistent with individual autonomy and the pursuit of principle – is to vote solely based on one’s preference, without any regard for how others will vote or how the election will turn out. Had Trump been one candidate among tens of independent contenders, he would have been rightly recognized as a demagogue whose base of support is a xenophobic, poorly educated fringe. Had numerous political parties been able to compete without major barriers to entry, today’s “moderate” establishment Republicans and movement conservatives would have had no need to fight with Trump over a particular party’s nomination, since they – having little in common – would have likely fielded multiple candidates of their own from multiple parties. As it stands now, however, the two-party system has destroyed the checks that would exist in a truly politically competitive system to prevent a fascistic demagogue’s meteoric rise. Only the consciences of voters stand between Trump and the Republican nomination, as well as the Presidency. Now, more than ever, it is imperative to vote solely on principle and escape the “lesser evil” trap, lest the greater evil of untrammeled illiberalism trap us forever. Transhumanism is the idea, philosophy, movement, what have you, that human beings both can and should be enhanced by the use of technology. So while some people use glasses, cars, phones computers, airplanes, and so forth, well, we Transhumanists want to go further. We want robotic hearts, we want to stay young, we want to be stronger, faster, smarter, and more loving than we are now. And we don’t people to feel depression, or rage, or extreme loneliness, or to experience cancer, AIDS, or disability of any sort. We want everyone to feel and function well, all of the time, and we want to grow as never before. For the entirety of our species we have only been changing the external – where we live, what clothes we wear, what religions we devote ourselves to and so forth. And now, I and many others believe that it is time to change the inside. It is time to evolve. It seems to me that within Christianity, as well as many other religions, there is the idea that one must devote to God, and God will respond – that is to say, God will heal you in his time. His time? Does that mean, not even in this life, and yet still you are asked to devote? If God is real, then at minimum, he should meet us halfway, and for each prayer, a little healing, and for each verse read, a little healing. But of course it doesn’t work that way, and the believer is told to keep going and just, well, believe. That to me sounds like mental slavery. And I will have none of it. Technology heals. Nature heals. Animals heal. People heal each other. And technology has the potential to be, and often already is, the greatest healer of all. Why devote to anything else then? P. S. In the movie Forrest Gump, what heals the legs of Lt. Dan? Oh right, technology. Please, brothers and sisters, let us now turn away from the empty promises of holy books, and instead let us support Transhumanism, for it shall lead us to real healing. So now we come to arguably our crystalline truth – if there is a biological problem, there is a biological solution. Zoltan Istvan for American President 2016. Reed Nelson is the founder of The Transhumanist Party of Calgary in Alberta, Canada. 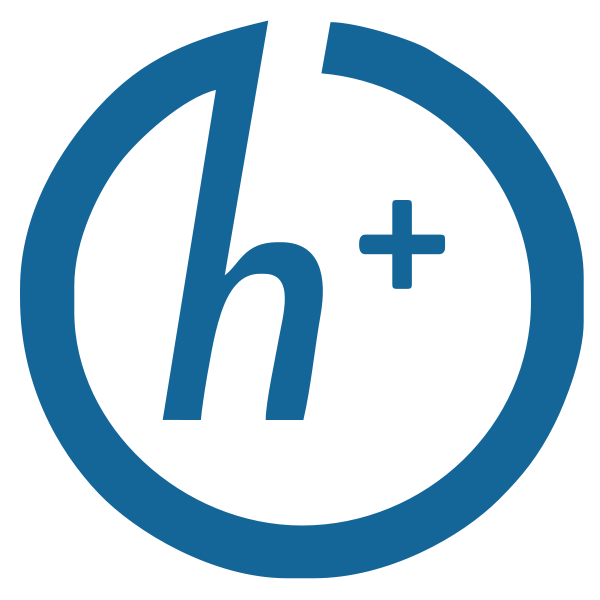 See the Facebook page of The Transhumanist Party of Calgary here. Donald Trump’s stump thump against Mexico is that it runs a $58 billion annual trade surplus with the United States. Trump somehow thinks this leaves America the poorer. He claims that it is out of that money, presumably sitting in some giant vault in Tijuana, that Mexico will pay for the border fence he wants to build to keep immigrants from entering the United States illegally. Trump’s pronouncements only demonstrate how he keeps facts and reason from entering his thoughts and, how he would keep Americans from making their own free choices in a free market. Trump’s very language reveals a glaring error concerning trade. Mexico and America do not trade. Mexicans and Americans do. Mexicans have $58 billion more in cash (pieces of paper with George Washington’s picture on them or the equivalent credits on bank ledgers) and Americans have $58 billion more in goods (electrical equipment, Trump-themed apparel). And Trump doesn’t bother to ask, what are those Mexicans supposed to do with those pieces of paper? If they don’t spend them in America, they’ve got nothing but useless paper. So the Mexican trade surplus also means that Mexicans are investing an equivalent amount in America, helping the U.S. economy grow. Further, the fundamental nature of trade between individuals is a win-win situation. Someone who buys an orange Donald hat for $20 to show his support for the former host of “The Apprentice” values the hat more than the twenty. And the manufacturer in Mexico who has a warehouse full of said head gear prefers the $20. If The Donald slaps a 30% tariff on all goods coming from Mexico, maybe his starry-eyed supporters would shell out $26, the higher cost of the hat. But a poor mother with five kids seeing the price of a pair of shoes jump from $20 to $26 might be hard-pressed to afford the extra $30 she’d need to cover the feet of all her five little ones. But Trump doesn’t care. He wants to get rid of that pesky trade imbalance and what better way than to discourage that mom from buying Mexican-made shoes for her family! On the other hand, maybe he will notice when Mexican investors pull out of his latest golf resort or skyscraper projects, because his policies have destroyed their profits. If Trump is so against trade deficits, he should have a serious problem in his own household. Trump no doubt runs a huge trade deficit with his grocery store. He gives them piles of money when he buys food—no doubt top-priced cuisine—but the store never buys anything from him. Maybe he should boycott it. Maybe we should all boycott our local grocery stores lest we be victims of a trade deficit. Maybe if elected president, Trump will slap a 30 percent “grocery tariff” on everything that those stores try to sell to us poor, exploited schleps until those stores start purchasing stuff from us. Trump poses as a friend of the people, but he wants to use government to prohibit the Americans from purchasing goods from whomever they wish—including Mexicans. The Donald presumes to know better what individual Americans should buy with their own money and at what price than they do. He’s determined to drive up the prices for Americans buying from Mexicans to teach those Mexicans a lesson. So what if American consumers and businesspeople are collateral damage. When governments take away the liberty of individuals to pursue their self-interest by trading freely with other individuals—a win-win situation—they set the stage for conflicts and even wars between countries. Trump’s proposed trade war is really a war on the American people. Copyright The Atlas Society. For more information, please visit www.atlassociety.org. Star Wars: The Force Awakens is already one of the most successful films of all time, and the Star Wars franchise is poised to grow at .5 past light speed for the foreseeable future. Yet, while Disney rapidly develops new chapters for the saga, it’s also quietly deleting some old ones: in 2014, Lucasfilm announced that to make way for the new films, the Star Wars Expanded Universe (or EU) would no longer be considered canon, a decision that disappointed many longtime fans. The EU refers to the vast number of novels, short stories, comics, and games that explore the Star Wars universe outside the major films. These works enjoy an enormous following but are now consigned to a kind of alternate universe called Star Wars Legends. In other words, they will be disregarded by Lucasfilm’s officially licensed material, and any new Star Wars stories will have to fit the new canon. 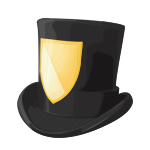 The original EU is discontinued, which understandably has fans feeling abandoned. Why should the EU pose a problem, though? Why can’t artists and fans simply continue developing the canon they love, while Lucasfilm does the same? The answer is simple: intellectual property law. Disney’s ownership of Lucasfilm allows it to license the Star Wars brand and all related intellectual property rights, especially its copyrights and trademarks. Anyone adding to the universe can only do so with permission, giving Lucasfilm power over any content within the universe or even similar to it. In fact, Lucasfilm has a long history of aggressively litigating its IP, suing everyone from small businesses to major corporations. One of the most infamous cases was brought against the original Battlestar Galactica TV series, which was accused of copying at least 34 distinct ideas from Star Wars. These included such astonishingly original concepts as a friendly robot, an imprisoned heroine, and a movie ending with an awards ceremony. Returning to the EU, it does make some artistic and financial sense for Disney to steer the franchise in a new direction by discontinuing older content. At the same time, artists and fans want to enjoy the EU they already know and love, something Lucasfilm legally prohibits by enforcing its IP. My point is not that one stream of content is objectively better, but that it’s vital for all involved to freely choose the kind of content they want to create and sell. By increasing costs to both consumers and innovators, IP has already played a role in the decline of art forms like classical music, and copyrights and trademarks have similar effects in the world of pop art. For Star Wars, original content mainly revolves around trademark rights, of which Lucasfilm owns many. Its usual defense of these properties is that unlicensed content causes confusion: without legally enforceable restrictions, consumers might think they’re buying “genuine” products when they’re actually getting cheap imitations. Furthermore, products similar to those created by Lucasfilm might be used to earn profits for noncreators who capitalize on confusion. A licensing deal from the original source ensures people won’t be taken in by unskilled or unscrupulous artists. Assuming this is the real motivation for trademark protection, the argument is still weak. Like many consumer-oriented regulations, trademark law is patronizing: its basic assumption is that people are too dim to distinguish between official products and knockoffs or other free riders on the brand. But consumers, especially the kind of devoted fans Star Wars inspires, are perfectly capable of figuring out for themselves which content they prefer. The real issue boils down to revenue: Lucasfilm doesn’t want other businesses profiting from ideas it “owns,” and it’s perfectly happy to use monopoly privileges to protect its bottom line. But Lucasfilm doesn’t need to litigate its trademarks to preserve profits or brand identity, which would likely be stronger in the long run without IP. For example, without trademarks, Lucasfilm would continue to officially sanction content it approves of and let consumers know which works are not “official.” If fans respect its judgment, the official Star Wars brand would thrive as people adopted Lucasfilm’s endorsement as a benchmark for quality and narrative continuity. Competition for fan loyalty would drive official and unofficial creators alike to produce high-quality content. Different groups of creators would specialize in their own alternate universes that would succeed or fail based on their ability to satisfy fans. This would also eliminate the uncertainty surrounding fan fiction, which exists in the complex gray area of “fair use” laws. Most importantly, we’d all be able to decide for ourselves which works we treat as canon and which we abandon to the garbage masher of history. Matthew McCaffrey is assistant professor of enterprise at the University of Manchester and editor of Libertarian Papers. NAFTA, supported by the Secretary, cost us 800,000 jobs nationwide, tens of thousands of jobs in the Midwest. Permanent normal trade relations with China cost us millions of jobs. Look, I was on a picket line in early 1990’s against NAFTA because you didn’t need a PhD in economics to understand that American workers should not be forced to compete against people in Mexico making 25 cents an hour. … And the reason that I was one of the first, not one of the last to be in opposition to the TPP is that American workers … should not be forced to compete against people in Vietnam today making a minimum wage of $0.65 an hour. Look, what we have got to do is tell corporate America that they cannot continue to shut down. We’ve lost 60,000 factories since 2001. They’re going to start having to, if I’m president, invest in this country — not in China, not in Mexico. In the first five years after NAFTA’s passage, 1994-98, when we could have expected it to have the most impact, the U.S. economy ADDED a net 15 million new jobs, including 700,000 manufacturing jobs. In fact, since NAFTA went into effect in 1994, total US employment has increased by 28 million jobs. 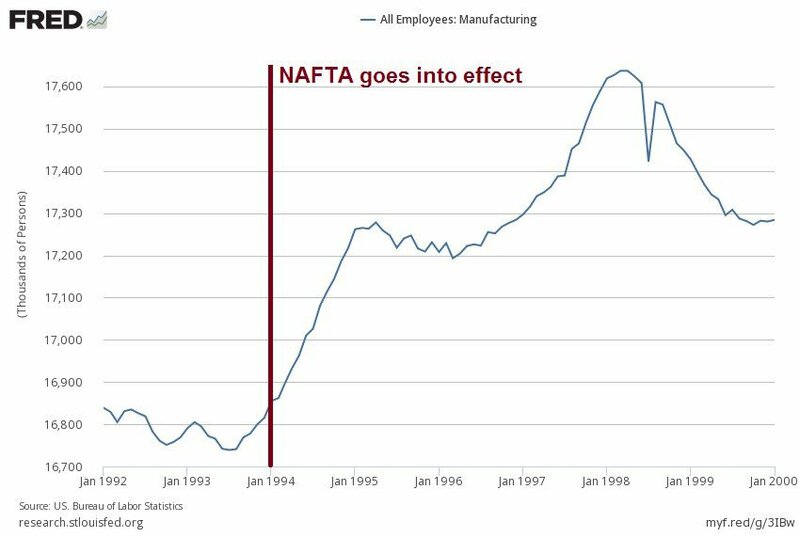 Even if we buy the dubious claim that NAFTA “cost us 800,000 jobs” over the last 22 years, this amounts just 36,000 jobs a year. As Griswold noted, even in good times, 300,000 Americans file for unemployment each week. The US economy creates and destroys more than 15 million jobs every year. This alleged displacement amounts to less than one day’s worth of job losses. It’s true that, in the long-run, manufacturing jobs have been in decline in the United States. But this is not because manufacturing is in decline. The myth (promoted by the other nationalist blowhard in the race) that United States “doesn’t make stuff anymore” is not just wrong — it couldn’t be further from the truth. 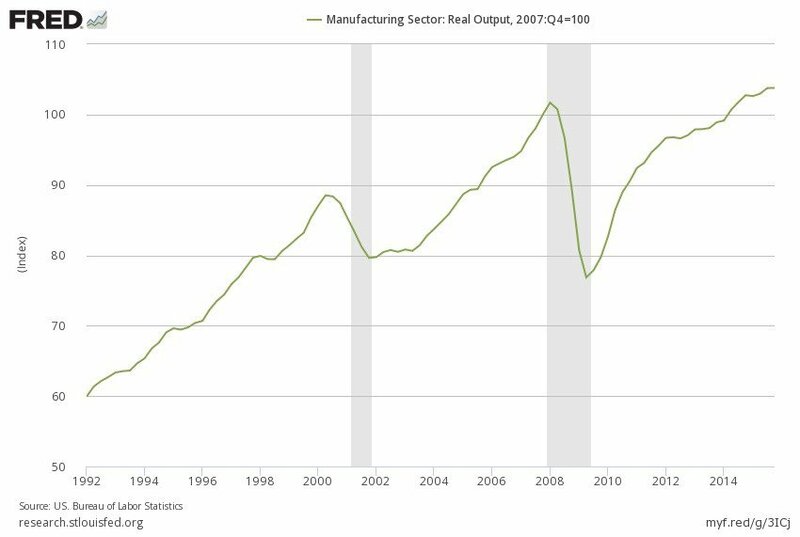 Real US manufacturing output is the highest it has ever been. Simply put, the US makes more stuff than ever. How can this be? Because manufacturing productivity — the amount of value added per hour worked — has gone up dramatically in recent decades. Manufacturing employment is declining because of automation; a US factory worker today can add a lot more value per hour than one in 1970. It’s simply not true that trade devastated the US economy and wiped out millions of jobs. Employment has shifted within the US economy, out of industry into service jobs, and manufacturing has shifted around the globe, aligning production with the comparative advantages of each country’s labor and capital markets. The resentment stoked by nationalists like Trump and Sanders is based on a nonsensical proposition, a mirage of high-paying blue collar jobs stolen by conniving foreigners, which we could reclaim if only we had the will to wage a trade war. Do we really want to “bring those jobs back”? Do we envision a future where the American middle class is sewing textiles in sweatshops for a dollar an hour? Of course not. Americans today likely wouldn’t do those jobs at any wage, but especially not at the wages paid to low-skilled workers in developing Asian and Latin American countries. Those jobs only exist at those wages; at higher wages, they are scarcer, higher-skilled, and more capital intensive. True, we could make t-shirts and Happy Meal toys in the United States, but we’d be doing it with far, far fewer workers and a lot more capital. Instead of 30 workers at fifty cents an hour, it’d be one person with a machine for $20 an hour. The real difference would be that everyone would be poorer as a result: consumers paying higher prices, foreigners working in worse conditions and for less money, and American resources being diverted away from where they are most productive. This is where economic ignorance stops being morally neutral and becomes a real threat to the life and well-being of the poor, especially in the developing world. Not content to merely keep Mexicans from working in the United States (where, thanks to US capital and infrastructure, they could earn three or four times more than they make in Mexico), Bernie Sanders now objects to the right of Mexicans to work in Mexico, if they dare to sell goods and services to Americans — or, God forbid, try to compete with American firms. For a champion of the poor like Sanders, there’s a double irony here, in that poor Americans are already much wealthier than poor Mexicans, and that tariffs also make goods more expensive for native consumers, disproportionately hurting the poorest Americans. Not only are poor Mexicans made worse off, by losing access to the US market and thus losing jobs, but poor Americans are also made worse off by having less disposable income, which is thus not spent elsewhere in the economy to sustain other American jobs. And this is just the first order effects of closing off trade with Mexico. When the Mexican government inevitably retaliates, US exports to Mexico (which totaled $236 billion in 2015) will also be devastated and more jobs will be lost. And of course, simply multiply this orders of magnitude for China, Vietnam, and every other country on the nationalistic hit list. Who gains from this? In the long run, nobody, which is why (after decades of gradual reform) we finally got relatively free trade with our closest neighbors, signed into law by a liberal Democrat. But in the short run, a few US corporations and labor unions would benefit from trade tariffs — at the expense of both poor foreigners and poor Americans as a whole. Did I say Alice in Wonderland? I meant Atlas Shrugged. Ayn Rand was justly accused of having unbelievable, one-dimensional stereotypes, but sadly, American politics seems to have the same problem. When Rand first published this in 1957, this was hyperbole about the fear of change, the reductio ad absurdum of the argument for keeping things as they are. Now, it’s an applause line for mainstream presidential candidates. Daniel Bier is the site editor of FEE.org He writes on issues relating to science, civil liberties, and economic freedom.